The fact is there are very few extraordinary combinations when it comes to wine and food, just as there are very few combinations that are truly terrible. I find that in the vast majority of pairings, the wine and the food don’t affect each other much; they coexist peacefully, if unexcitingly. In a modest percentage of matches, the wine and the food accentuate the flavors in one another, and both taste better as a result; however, an equal percentage, I’d say, are the reverse. Don’t match strong to delicate. Pairing a big, powerful, high-alcohol or high-tannin wine with a light, delicate dish (and vice versa) is rarely a good idea. Acidity is your friend. People tend to be wary of wines described as "high acid," like Sauvignon Blanc or Muscadet. Who wants to drink acid, after all? But there’s no better quality in a wine for matching rich, creamy or cheesy sauces, deep-fried foods or fish dishes; in addition, tart wines go better with tart foods, such as a vinaigrette on a salad. Tannins pair well with fat. That’s because the astringency of the tannins cuts through the viscosity of the fat. Follow the don’t-upstage-the-star rule. If you have an amazing bottle of wine you want to show off, especially an older vintage (they tend to be more subtle, their flavors less flamboyant), don’t serve a wildly complex dish with it. A simple dish will allow the wine to be the center of attention. Yes. Some foods contain chemical compounds that clash with wine. For instance, artichokes contain the compound cynarin, which tricks people’s taste buds into perceiving flavors that aren’t really present. For most people, cynarin creates sweetness where there isn’t any, meaning that a tart, fresh wine like a Sancerre will taste strangely, unpleasantly sweet. (For a few people, the cynarin reaction is reversed and makes other foods taste peculiarly bitter.) Asparagus contains methyl mercaptan, a sulfur compound, which tends to give wine a vegetal character. Some fish—cod, haddock and mackerel are good examples, as are shellfish—are high in iodine, which is why red wines don’t do well with them. The iodine content reacts with the tannins in red wine and makes both the fish and the wine taste metallic and, generally, awful. Finally, egg yolks are also difficult to pair with wine, because they tend to coat the palate and kill flavor. Oddly, some of the classic combinations that are supposedly incredible often prove to be perfectly good, but not inspired—a big steak and a big Cabernet would be one example. It’s certainly enjoyable, but to my mind neither the food nor the wine really does anything exceptional to each other. The combinations that have thrilled me tend to bring together more unusual tastes (maybe because I’m jaded and have been at this too long, but who knows?). Melon and prosciutto and dry Muscat. The perfumy, grapey character of the Muscat—Terre di Orazio’s bottling is particularly good—complements the melon, while the saltiness of the prosciutto makes a nice counterpoint to the wine’s ebullient fruitiness. Black truffles and old Burgundy or white truffles and old Barolo. Truffles have a wild, musky, earthy depth that goes very well with the aromas and flavors—gaminess, spice notes, earth, dried fruits and, well, truffles—that these wines acquire over time. Raw Belon oysters and steely, crisp Muscadet. Belons are difficult to pair with wine because of the intensely briny, almost metallic edge to their flavor, but Muscadet’s vibrantly tart citrus notes are like a squirt of lemon juice (but the taste is even better). Plain roasted chicken and really good cru Beaujolais, like the Côte de Brouilly from Château Thivin. Cru Beaujolais is one of the world’s most underrated wines, and its fruit character (shading from cherry to blueberry or blackberry, depending on the village) and graceful structure really shine with a simple dish like this; it doesn’t overwhelm the food. Plus, chicken and Beaujolais are both really good the next day, lightly chilled. Dark chocolate desserts and Bual or Malmsey Madeira. Chocolate is very hard to pair with wines, but Madeira’s combination of acidity and sweetness works extremely well with it. Finally, one of the best matches I’ ve ever had was Barsac, a French dessert wine made from Sauvignon Blanc and Sémillon, and a foie gras terrine served with a Granny Smith apple gelée. I recently had this dish at Manhattan’s Per Se, and it was pairing at its best. The wine was great by itself, as was the foie gras, but together they were stupendous; the combination of textures and flavors (the honeyed fruit of the wine, the tartness of the apple gelée) just took my breath away. I’ve found that lightly sweet Germanic white varieties such as Gewürztraminer and Riesling work well with spicy foods, particularly Indian and Asian cuisines. The light sweetness cuts the heat of the spice, and the firm acidity helps balance the richness of the oil (particularly a consideration in Asian cuisines) or clarified butter (in many Indian dishes). Red wines tend not to work so well, partly because their tannins can clash with the spices, though something like a good, fruity Zinfandel or Grenache with a dish like Mongolian beef can work well. As a side note regarding sauces, I had an epiphany of sorts not long ago at a presentation by chef Rick Bayless and sommelier Jill Gubesch of Chicago’s Frontera Grill. They were talking specifically about classic Mexican cuisine and pairing wine with it. Their general advice was always to pair wine first with the sauce on a dish, not the fish, chicken, beef or what have you. Their rationale for this is that classic Mexican cooking is defined by what sauces are used, but as I was sitting there, it occurred to me that this advice actually extends to many dishes beyond Mexican ones. For instance, if you cook chicken cacciatore, you’re really pairing wine with the tomato-based sauce, which provides most of the flavor, not the chicken itself. Essentially, one thing you want to do with wine pairing is think about the dominant flavors of the dish, whatever they happen to be, and choose a wine you think will complement them. Of course, if the food is so spicy that you break out in a sweat and fan your mouth after each bite, then, yes, forget the wine and open a beer. Or maybe even a carton of milk. Yes. Generally speaking, the sweetness of most desserts will kill the flavors of most dry wines. I do think that fresh fruit and an ever-so-slightly sweet sparkling wine like Prosecco work terrifically well together, but that’s about it. However, I also find that pairing extremely sweet wines with extremely sweet desserts can result in a kind of taste-bud overload—for instance, trying to sip an unctuous, insanely sweet PX Sherry with something like sticky toffee pudding. It’s also worth noting that ice cream, and any dessert that’s served very cold, will only numb your taste buds, making the idea of a wine pairing somewhat of a moot point. For my money, what matters most when pairing wine and food are two things. First, the dominant flavors of the dish and whether those flavors are complemented by or in conflict with those of the wine, and then the richness (broadly speaking) of the dish and the corresponding weight of the wine. That being the case, the grape variety matters a lot. The producer also matters, in terms of the style it hews to (for instance, Bollinger makes very full-bodied Champagnes, whereas Taittinger tends to have a lighter-bodied, more delicate style), and the vintage probably matters least—though in some regions that have substantial vintage variations, such as Burgundy, one year may produce very light wines (e.g., 2004 red Burgundies) and another very powerful, intense ones (e.g., 2003 red Burgundies). Essentially, though, my suggestion—after an initial suggestion, which is not to torture yourself worrying about making a wine-pairing mistake, since as I mentioned earlier, the vast majority of foods and wines exist in a kind of pleasant neutrality together—is to pair flavor to flavor, and weight to weight. So, if you have a citrusy sauce on a piece of halibut, look for a light-bodied white wine with a citrusy edge to it, say Sauvignon Blanc or dry Riesling. If the flavor question is perplexing—butter-poached lobster with tomato marmalade and celery batons—you can at least match weight to weight. Butter-poached lobster is about as rich as things get, so a substantial, rich white is probably the way to go. Well, if you were to ask someone from Falset, in Spain’s Priorato region, whether Priorato reds go well with oca amb naps (goose with turnips, a local classic), the answer is likely to be a Spanish version of "Um, what else would you serve with oca amb naps?" In other words, there’s a kind of default logic at work here: The wines of a certain region go well with the foods of a certain region because they’ re both from the region and everyone has always eaten and drunk them together. 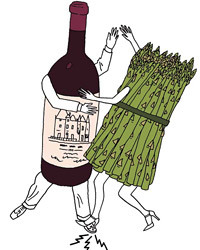 That said, climate and culture do seem to work together to create felicitous food-and-wine combinations; the rosé wines of Provence do taste awfully good with bouillabaisse, and Tuscany’s arista di maiale (pork loin roasted with rosemary and garlic) is a natural with Chianti Classico—the wine’s firm tannins and slightly herbal character just seem to go naturally with the herby roasted meat. In part this is because these are regions that have hundreds of years of culinary and viticultural history, where the cuisine and the wine have grown up together, in a sense. Saying that the wines of Napa Valley are particularly suited to the cuisine of the Bay Area is, on the other hand, probably a bit more of a reach. But in general, it’s hard to go too wrong matching the wines of a region to the cuisine of that region.